Just a reminder for those of us in the USA and, in a few weeks in Europe. Check to ensure that your time appears correct when you make a post. I've had to modify my profile...there is a checkmark / tick box on the bottom of the page for DSL adjustment. ...there is a checkmark / tick box on the bottom of the page for DSL adjustment. I meant to say DST adjustment ... today was when the clocks were supposed to be moved forward. Bit of the ol' April Fool in the AM when I saw all of the VCR and TV clocks an hour ahead! Daylight Saving Time in the USA has been changed this year. It started on Sunday 11th March and ends on Sunday 4th November. In the UK it began on Sunday 25th March and ends on Sunday 28th October. British Summer Time ended this morning, so this is a reminder to our UK members to change the 'Currently Observing DST' setting in your profiles to 'No'. I believe this also applies in Europe. As the USA and Canada is now on standard time starting today, this also applies to us as well. It does the whole thing for you & its free. It tells you if the place you're ringing has daylight saving & whether its Tuesday. Not a brain cell has to be disturbed, particularly if they're in short supply. 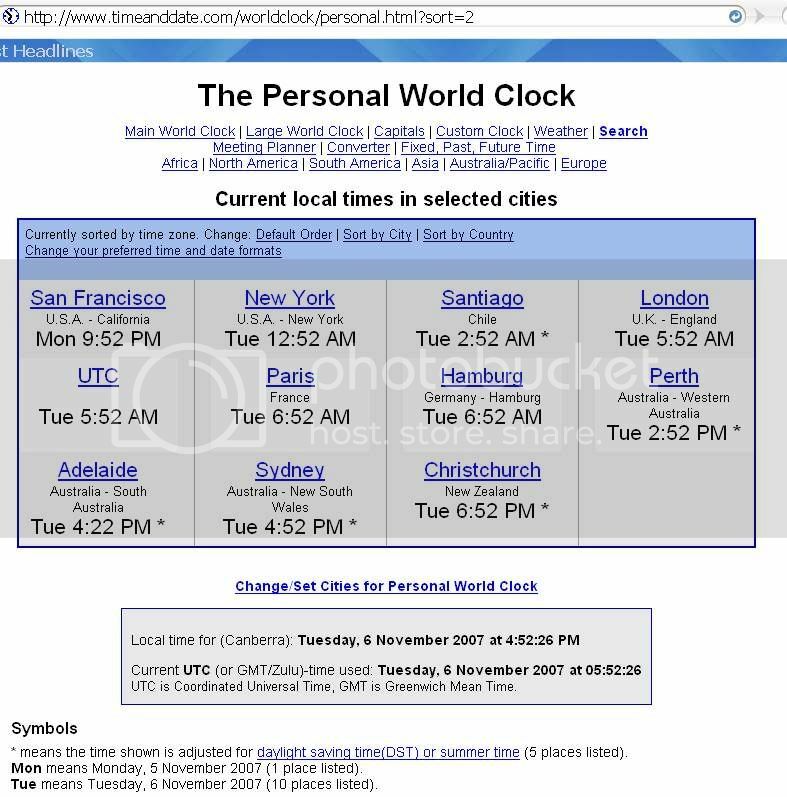 That is a very cool web app It beats my world clock gadget. Yes I agree , nothing short of brilliant isn't it? It's so good that I printed it and hung it on the wall... but it's only right once a day! And only the one day. ...And it wasn't my day; I can tell you that for nothing! Just a reminder for those of us in the USA and Canada to adjust for Daylight Saving Time in your Profile. There is a box at the end of your Modify Profile screen for DST, select "yes". For everybody in the UK, British Summer Time begins on Sunday 30th March 2008 and ends on Sunday 26th October 2008. I'll post a reminder nearer the time.